12:25pm In the kicks room, Kara and Mike are talking. Mike invites Kara to a dinner in the backyard with him for her birthday where Joe would cook for them. Kara is taken back and says that she would need to think about it … maybe outside the house we could hang out but I don’t know. Mike says normally you would just say yes… but that’s okay I understand theres a perception of me in the house because of what I did in my season. Mike tells her to just think about it and let him know. They break up the conversation and leave the room. Back up in the HOH room, Willie, Shane and JOjo are talking. Shane explains that last night he wanted to save Frank and now he wants him out. The feeds switch to Britney, Janelle, Ashley and Joe in the arcade room talking. Britney says that Willie got played by Frank and now hes upset about it. Joe says that when Frank talked to him last night it upset him… that’s why I went to my coach Janelle first. Britney tells them that they all need to stay together so that we can take this whole house. Janelle says we make Kara think shes leaving, we make Frank think he is safe and then on Thursday we vote Franks A$$ out! Britney talks about how Boogie came up to them last night by the hammock and talked trash about Dan and didn’t say one word about his team. Not even Franks a good guy you can trust him… nothing. Mike is a bad guy. Joe says Frank was safe too ..he should have just kept his mouth shut. Britney says that it will be really dangerous to keep Dan in this game. He has a way with words and will swoop in on our team and steal one of them if we’re not careful. Britney says that she was in a mist after she had a conversation with Dan ..that’s how good he is. Watch what happens AS it happens: Big Brother Live Feeds! FREE 3 Day Trial! 12:50pm Britney, Ian, Dan, Mike are talking. They are talking to Ian about how he asked Ashley out on a date. (A slop dessert date cooked by Joe) They ask him how he would rate himself right now. Ian says 8. Birtney says that’s up from last night …you were a 6. Mike tells him to dress up …maybe bring a condom. Mike asks Ian if Ashley is the hottest girl he has ever asked out. Ian says yes definitely. They say that Ashley said yes pretty quichly too … a little hesitation at first but she was just a bit taken back. Britney and Mike give Ian a bunch of talking points for his date. Mike then heads inside to talk to the chef about his menu. Willie tells Kara not to go around talking, I am not trying to control you. Dont go talking to Dan and get him riled up. Just tell him I havent made my mind, which is true. Willie asks that he has her vote if he go up or if you get HOH you will not put me. We can start to build a relationship. We are both good physical players and you have brains, it could be a good relationship. Before you know it, it might be you and me at the end. Just dont tell Dan. Kara says I will just tell him you are not sure, since that is the truth. Willie: I really would like you to stay in the game and I want to trust you. Kara tells Willie that she wants him to trust her. Willie: Anyone can win HOH next wek. Willie tells her that we have four days. We have to keep this situation, since we do not want to tell someone 4 days in advance they are going home. I just want to make sure you have my back next week. Kara says yes. Willie and Kara then hug and they both head downstairs. When she gets downstairs and heads outside Mike tells her that Ian & Ashley have a slop date tonight …Dating is in the air! Mike has a quich chat with Ian on the backyard couch. Mike coaches Ian telling him that he did something good today, every time someone pays you a compliment that you put youself down at the same time. Mike wants Ian to try and not look so smart so that he isn’t seen as a threat. Mike tells him that after Ian rattled off the order of evictions for 13 seasons of big brother people know you’re smart and know a lot about the game. 12:55pm Mike and Frank have a conversation in the storage room talking. Mike says that he was kind of glad Shane didn’t use the POV …because he thought he might use it on someone else. Mike tells Shane to talk to Willie and firm up the deal and even throw out the “Brigade” alliance with the three strongest guys (Shane, Willie, Frank). Shane comes in and Mike tells him that they are scheming … then tells Shane about making a “Brigade” alliance. Willie then comes and Mike says speak of the devil. 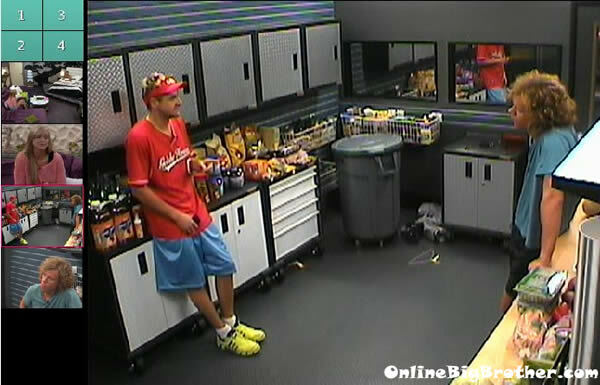 1pm Kara and Dan are in the kicks room, she is telling him about how Mike asked her out on a date in the house. Kara said that it was so uncomfortable and that all she wanted to do was laugh. It was so awkward. She says its so uncomfortable around him now. Dan tells her to just tell him that you told your family that you wouldn’t get into a showmance in the house. Kara says that she was trying so hard not to crack up. 1:15pm – 1:40pmBig Brother turns on the control room music but the video of the house is still playing on the live feeds so we can’t hear what they are saying. It didn’t look like much happened but Willie and Dan shook hands, not sure over what though. LMAOOOOO………DANG i missed it would have loved to see Booger’s reaction when he got rejected. GO KARA!!!! Brigade alliance, we already have that in bb12 and it would not work this time. Come up the new alliance. Wow! Ian aka Carl of Phineas and Ferb dating Ashley aka Porsche 2.0! It’s like Beauty and the Geek! Let see Ashley (Beauty) and Ian (Geek)! That’s like Beauty and the Geek of Big Brother all over again! Kara is not very smart. She laying all her eggs with Britt and Janelle’s team because she’s starstruck with Janelle and saying that she doesn’t trust Boogie, and she’s going to look stupid if Boogie’s team comes out on top the next HoH. She needs to stay cordial with both sides right now. She must not realize that she’s still going to be targeted if either B or J’s team wins the next HoH. Ian (Carl)….He like to eat Slop, Ian (Carl)…..He Sleep in Havenot room! 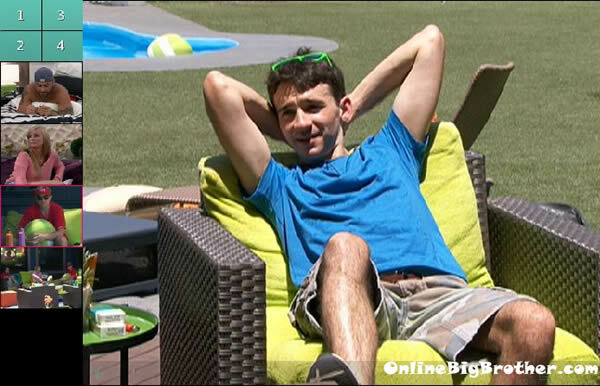 Ian (Carl)….He hangouts in backyard,Ian (Carl)……He know bb season, Ian (Carl)….He do what the coach tell him. He really know it all…Ian (Carl)! Ian, you do look like Carl from Phineas and Ferb! Aww….I can’t believe I missed that! (I just watch BBAD not the feeds). I feel bad for Mike. And don’t you mean he asked her out for his birthday not for hers. Mike’s b-day is like the next day but, I checked hers and it’s in February. That makes it so much worse!! Someone should let any of Booger’s potential hookups. dates or sexual partners that he is a herpes carrier.